I recently became inspired to start this blog after interest and curiosity in our home continues to grow, and realizing how much I enjoy discussing the subject with others. I hope that sharing the journey we have set out on will inspire others to save our nation’s important historical and architectural treasures so that more of them are not lost to time. I am not sure where exactly to start, but being a logical person (about most things), I suppose the beginning shall do, so here goes. I should let you know a bit of back history before I get too far. I am an Interior Designer, and my husband Ben is a Business Analyst, both working in Washington D.C. We both have a great love of history, art, and architecture. As children we both had been inspired by our parents and grandparents to appreciate these things so the love of an old house came naturally to us. 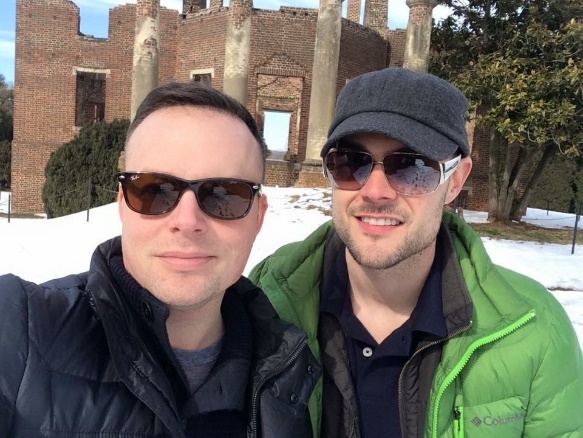 We were like many typical couples living in downtown Washington, D.C., we lived in a condo, had a dog, enjoyed the convenience of taking an Uber to meet friends across town for dinner or happy hour, and taking walks through the busy neighborhood streets. However, our favorite pastime was to pack up our pit bull rescue Gracie in the car, and head to the Virginia and Maryland countryside to hike, explore, visit house museums, look for antiques, taste wine and enjoy the clean air. As time went by, and we spent more and more time doing this, we started to dream about giving up our city life for the peace of the countryside, and owning a beautiful old house with some land. The area around Washington DC is full of such places dating into the 17th century. For those of you who do not live near our nation’s capital, real estate is very expensive and finding a place that had “character and land” is no easy task and we were not sure we could even entertain the idea. We started by literally opening up the Redfin app on our phones as we drove through areas we liked and seeing what was available. Seeing many wonderful places, we soon came to realize a renovated house was not in the cards financially. After some online research we found a few good websites such as www.historicproperties.com and www.historichometeam.net, to look through period specific homes. One day casually looking through these sites, I saw it. Erroneously labeled a c.1870 house, it was in reality, a marvelous white painted brick Federal on a waterfront lot of 7 acres, built in the first quarter of the 19th century c.1820. The house was intact but was in need of an enormous amount of work. The home had been rented for years, then left vacant, and subsequently broken into and robbed of all of the copper pipes, thus creating some water damage. Also, it was a long 60 mile drive from the city, quite a commute with the DC traffic. Did that scare us? To be honest it did a little, but something about the place spoke to us, so we contacted a realtor to set up a showing. We decided to make a day of it and drove north to the property in the Maryland countryside about 15 minutes west of Frederick. Upon exiting the highway we immediately noticed the area was quite charming with golf courses, historically rich architecture, and a rolling bucolic landscape filled with gorgeous ancient trees. As we turned on to the road that would lead us to the house we even passed a vineyard, this was looking up (who doesn't want to live near a vineyard)! Then there it was, a proud, excellent example of its style, commanding a site against the historic Antietam Creek, the very same creek that “ran red with blood” during the Battle of Antietam in 1862. As we waited for the realtor to arrive with the keys to see the house, we couldn’t sit still so we decided to walk around the yard. Nothing was to prepare us for the way that we felt that day as we got out of the car and were first introduced to what we didn’t know then would become our home. As we made our way down the gentle slope away from the main house to the creek we noticed an overgrown bramble of bushes that seemed to have a “tunnel” formed in its branches. Ducking low and passing through it we came out into a stone ruin with an enormous fireplace and the most gorgeous views of the creek. One look at each other and we knew. That was the moment, and we knew that this was going to happen. For all of you reading this who own an old house, there is always “the moment” when you fall in love with a place and there is no turning back. For you that are looking or thinking about looking for a historic house, the best advice I can give you is watch and listen for “the moment”, you will know. It took several months and a lot of negotiating and jumping through hoops but finally the house was ours. We closed in the summer of 2015, sold our real estate in the city and moved in with my parents while the work started. This is the story of Cool Hollow House, its restoration, and the family that loves it. I hope you enjoy this blog. I will do my best to post each week. Enjoy!